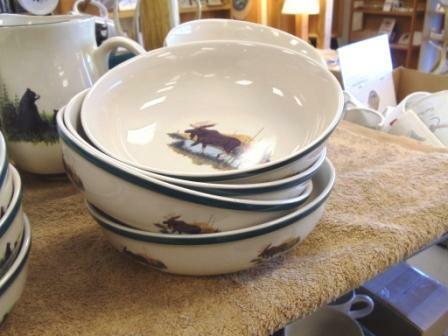 Cabin Series 4pc Bowl Set - Features a natural glaze stoneware with dark green hand painted rim and is 9" diameter and 2 1/2" Height. Original Artwork of the Landscape Moose by Dann Jacobus. Love them, size is great, wide but not too deep so can use for many different kinds of foods.